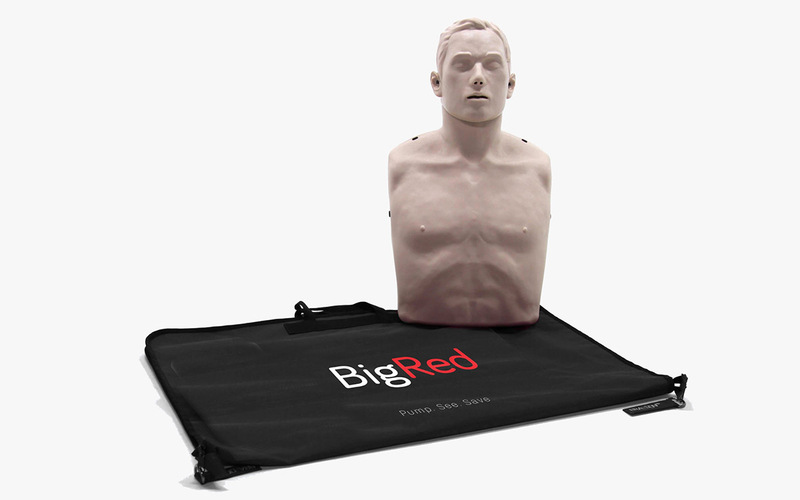 The American Red Cross is revolutionizing adult CPR training with the new BigRed mannequin. BigRed provides instant feedback for learners and increases both the confidence and willingness of a responder to provide care in an emergency situation. The decision to swap out old mannequins for BigRed comes from scientific evidence including the 2015 International Liaison Committee on Resuscitation (ILCOR), Consensus on Science with Treatment Recommendations (CoSTR) and the American Red Cross Scientific Advisory Council (SAC) scientific review of CPR feedback devices. All of them show that directive feedback devices improve learning of CPR skills and, more specifically, chest compressions in the classroom. 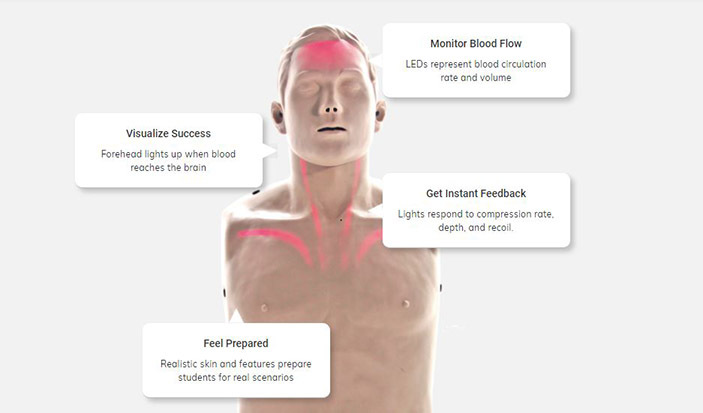 The BigRed mannequins equipped with LED lights provide instantaneous feedback on four critical components of high-quality CPR: hand position, chest compression depth, chest compression rate and chest recoil. 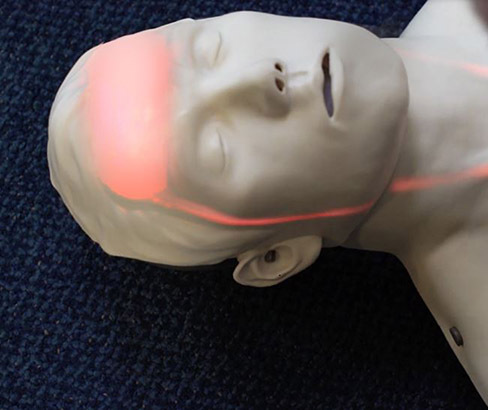 With correct hand position and chest recoil, the mannequin’s forehead illuminates; the circulation flow illuminates when chest compression depth and rate are accurate. Besides the visual feedback, an audible feedback “clicker” feature signals correct compression depth of at least two inches. To see a BigRed mannequin being used by students in a class watch this video. Starting in 2018, all instructors who teach classes such as FirstAid/CPR/AED, responding to emergencies (RTE), CPR/AED for professional rescuers (CPRO), basic life support for healthcare providers (BLS), lifeguarding, and emergency medical response (EMR) have been provided with information that will help explain what feedback devices are and how to best incorporate them into the classroom experience. Since starting to use the BigRed, both instructors and participants have commented on the effectiveness of CPR training. In particular, instructors are enjoying a better way to determine participant skills and identify the areas needing improvement. Participants are equally excited to visualize in “real time” the effects of performing chest compressions and assessing their skills improvement quickly during practice sessions. Most adults are visual learners, so seeing the red lines move up from the torso to the forehead is a very powerful reinforcement that they are performing compressions properly. While the mannequins’ visual and audible feedback indicators are used to assess the chest compressions, the instructor’s knowledge and professional judgment still remain the decision point for the learner’s skills assessment. The American Red Cross believes that BigRed mannequins will better prepare the participants for emergency health and safety situations. In short, taking CPR from the American Red Cross is a better learning experience than ever before. Register here for one of our many new and improved courses to Pump the chest, See the lights, Save a life!